Public concern about our increasing exposure to electromagnetic radiation is on the rise. Despite claims by government and industry about “no health risks,” proactive consumers are looking for solutions. One that has recently appeared on the scene is a shiny black rock called shungite. EMF (electromagnetic frequency) protective remedies are a dime-a-dozen on the internet, but what can we believe? How do we separate fact from fiction? Is shungite a healing miracle or fanciful hoopla? As someone with a background in science, I look there first. I am a health and science writer with a background in both the physical and biological sciences. In addition to many years’ as an RN and then as an advanced practice psychiatric nurse, I have spent the last 15 years in integrative and functional medicine. What many don’t know is that my first degree was in geology—so it’s really no surprise that the healing powers of crystals have captured my heart and soul. Even with this extensive background in science, experience has taught me that science has its limitations and other bodies of wisdom should not be so quickly discarded. Science—or what we Westerners generally consider “legitimate science”—often lags behind the wisdom of the ancients, and I have seen many well-meaning scientists blinded by their biases. We live in a sea of radiation and it’s getting worse. Computers, cell phones, cordless phones, smart meters and Wi-Fi—it’s all around us. Research is mounting about the potential health risks of our long-term exposure to this unnatural radiation. We are electrical beings. Everything in the natural world produces an electromagnetic field, from animals to humans to the earth herself. German studies show that living cells emit something called biophotons—weak electromagnetic fields that help them communicate with one another. It makes sense that EMFs from manmade devices could not help but interact with our own electromagnetic fields, for better or for worse. But do cell phones cause brain cancer? What about DNA damage? Reproductive problems? We can’t point to definitive data—yet. But as any electrosensitive individual will tell you, the symptoms are real. Many are beating the drum for shungite. In this article, I will review what we know about this mysterious rock and attempt to sort through the quasi-scientific mumbo jumbo while dispensing with a few untruths. Shungite has some impressive research behind it. Truth be told, I am a fan, but the data needs to be put in perspective. Before I get into shungite, I’ll bring you up to speed on the latest science about the risks of EMFs. The National Institute of Environmental Health Sciences defines EMFs as “invisible areas of energy, often referred to as radiation, that are associated with the use of electrical power.” A wide range of electronic devices emit EMFs including baby monitors, cell phones, cordless phones, Wi-Fi routers, smart meters, and other wireless devices. Cell phones… can’t live with ’m, can’t live without ’m. Although many continue to poo-poo the risks, there is plenty of data to make my alarm bells ring. 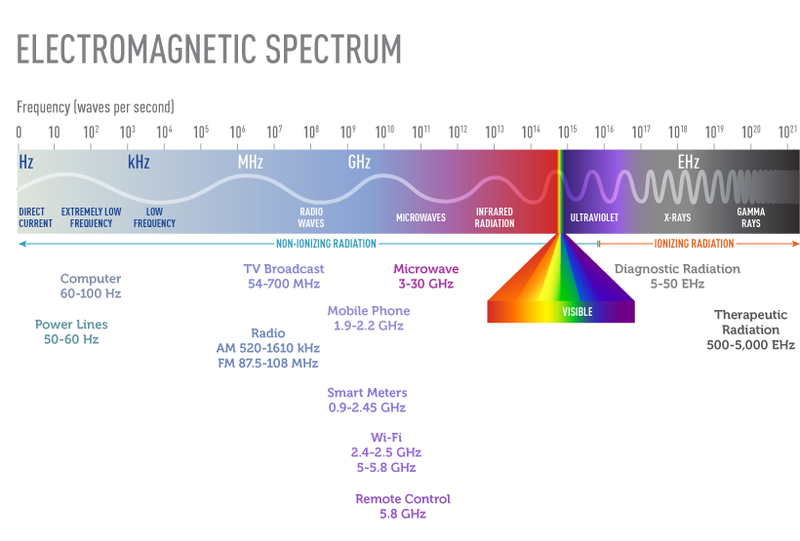 Cell phones emit microwave radiation in the 2 to 5 Gigahertz range. In 2016, the National Toxicology Program released disturbing preliminary results from the largest ever cell phone study showing a link between cell phone radiation and cancer. Rats exposed to the frequency of radiation emitted by cell phones develop two kinds of cancerous tumors: gliomas in the brain and schwannomas in the heart. Sadly, these results are in alignment with several observational studies finding links to the same types of tumors in humans, plus acoustic neuromas and meningiomas. After an extensive scientific review, in 2011 the IARC (International Agency for Research on Cancer, part of the World Health Organization) released a report classifying cell phone radiation as a possible human carcinogen. In 2015, 190 independent scientists from 39 countries sounded the alarm for stricter controls on cell phone radiation. Yet, in spite of all this, the US government continues to insist cell phones are completely safe, and the CDC even deleted cautions from their cell phone fact sheet. One study found that using a cellphone for just 20 minutes per day increases brain tumor risk by 300 percent over the course of five years. Whatever risks cell phones and other electronic devices pose to us, they pose an even greater risk to our children. Holding a cellphone to your ear allows between 10 and 80 percent of the EMFs to penetrate two inches into your brain—which is especially concerning for infants and children whose heads are smaller and delicate brains are still developing. Cell phone radiation may be harming our children even before birth. In a study published in the journal Epidemiology, researchers found a 25 percent increase in emotional problems, 34 percent increase in peer relationship issues, 35 percent increased hyperactivity, and 49 percent more behavioral problems among children whose mothers used cellphones during pregnancy, compared to moms who did not. EMFs have been shown to cause serious mitochondrial dysfunction from free radical damage. Mitochondria are the little energy powerhouses inside our cells. Free radical damage is linked to anxiety, dementia, autism, ADHD, cardiac arrhythmias, depression, and infertility. Dr. Martin Pall of Washington State University has published a number of papers about the mechanisms by which EMFs inflict damage to plants, animals and humans. He has concluded that EMFs damage voltage-gated calcium channels (VGCC), allowing calcium to flood into your cells. This triggers a biochemical cascade resulting in massive numbers of free radicals that damage your cell membranes and mitochondria, break your DNA, accelerate aging, and drive up your risk for chronic disease. Rates of chronic disease are soaring. Since 1990, we have seen an explosion of autoimmune, neurological and metabolic diseases. Alzheimer’s has increased by 299 percent, depression by 280 percent, and chronic fatigue by a staggering 11027 percent. Many experts speculate that mitochondrial damage from EMFs is a major factor. To learn more about the health risks of EMF exposure, Ann Louise Gittleman has an excellent and very readable book on the subject, Zapped. Now that you have an evidence-based understanding of the risks of radiation, let’s take a look at one of the tools that we can use to help shield us from this growing 21st Century threat: shungite. If you’ve never heard of shungite, you’re not alone. This mystery mineral first came into my awareness when I was researching crystals with EMF-protective properties. Many crystals and minerals are described by energy workers as protective against radiation, but there is little science behind most of these claims. Not to completely discredit the body of what I would call “intuitive knowledge,” but it’s nice when empirical studies actually exist! Shungite is unique in that there is actually a scientific basis for its claims—or at least some of them. Shungite has wide-ranging health (and industrial) benefits stemming from its extremely unique molecular structure. It is touted as offering everything from radiation protection to treating infections, inflammation, allergies, high blood pressure, osteoarthritis, digestive problems, and skin conditions. In Russia, shungite has been studied extensively for the treatment of depression, trauma and all sorts of mental/emotional problems. Shungite is the world’s oldest hydrocarbon-based rock. It’s not a mineral in the strictest sense of the word, although it’s often referred to as one. Shungite comes from only one place on Earth—an area known as Karelia, which is a geographic area divided between Russia and Finland (just north of Saint Petersburg). In 1887, shungite was named after the village Shung’a in Russian Karelia, near the shore of Onezhskoe Lake. The Karelian rock formation, known as the Zazhoginsky deposit, contains about 35 million tons of shungite and shungite rock. As the story goes, in the 18th century, Peter the Great noticed shungite’s powerful healing effects and constructed a shungite spa for his soldiers. Many had been poisoned by a type of ore they were processing. Men who drank water from a nearby spring that ran through the shungite deposit recovered in just three days—much faster than normal. This is the origin of “shungite water,” which I’ll be discussing shortly. Shungite has unique physical and chemical properties due to its microstructure (atomic structure, conductivity, and magnetic properties). It consists of unusually large, hollow, and stable carbon structures with a high oxidative and reductive capacity, which is where shungite derives its antioxidant properties. The mineral’s conductivity is one way you can distinguish between real shungite and a fake, which I’ll talk more about later. There are different grades or classes of shungite, based on its carbon content. In the literature, I noted three-grade and five-grade classification schemes, but the three-grade is most widely used. Originally, the term “shungite” indicated only those specimens that were 98 percent pure carbon, but now it is now used more broadly to indicate any rock that contains some shungite. The box that follows is the classification scheme used by Regina Martino in her book Shungite: Protection, Healing and Detoxification. This scheme begs the question, what about 70 to 98 percent carbon, and zero to 30 percent carbon? Another classification scheme divides shungite into low carbon (5 percent), medium carbon (5-25 percent), and high carbon (25-80 percent) varieties. The problem with this is, it leaves out the most valuable type of shungite—the 98 percent carbon variety. Why does carbon matter? The more carbon your sample has, the stronger its wonderful properties. The reason for this is a molecule called fullerene. What on Earth is a fullerene, you might ask? In 1985, laboratory chemists synthesized unique, hollow, carbon-rich molecules shaped like soccer balls. They named these new molecules “fullerenes” (or “buckeyballs”) after the late Buckminster Fuller, famous for his geodesic dome architectural structures. Fullerenes were basically molecular hexagons and pentagons bound together into hollow cages. Each carbon atom served not only to hold the molecule together, but also as a point of attachment for an external atom or molecule. This structure gave rise to a staggering number of chemical combinations. Fullerenes became the “tinker toys” of nanotube technology, giving rise to all sorts of innovations from drug delivery systems to solar cells to bulletproof vests. In 1991, Science magazine distinguished fullerenes as the “molecule of the year,” and in 1996, the scientists who originated them were awarded the Nobel Prize in Chemistry. When synthesized in the lab, fullerenes were considered nonexistent in nature. But in 1992, they were discovered in shungite! To this day, scientists remain mystified about how these unique molecules were able to form. They require very high temperatures and pressures; therefore, the top two theories of origin involve lightning strikes and meteorites. Fullerenes are not abundant in shungite, despite what you might read. In fact, they’ve only been found in elite (noble) shungite and black shungite, with a greater proportion in the elite. One analysis estimated fullerenes to represent only 0.0001 to 0.0001 percent by weight. Shungite contains seven types of fullerenes, containing between 24 and 70 carbon atoms, but from what I understand, only the larger fullerenes (60 and 70 carbons) have the desired stability. Naturally occurring-fullerenes have the additional property of encapsulating water and gases (helium for one) inside their hollow carbon vaults. Natural fullerenes are members of a highly exclusive club. Since their discovery in shungite, they have been found in fulgurites (glassy rocks produced by lightning strikes), meteorite impact craters, lava flows, coal, fossilized dinosaur eggs, and cosmic dust from planetary nebulae. Personally, I vote for the meteorite impact theory. The Karelians have utilized fullerenes for centuries without knowing what they were. It’s believed the healing properties of the spring water that flows through shungite outcrops is a result of the fullerenes. Shungite is one of nature’s gifts for cleansing the environment, but it may have equally impressive effects for cleansing our bodies. Shungite can be consumed orally or applied topically via shungite water, or the stones can be worn on or close to the body. Thanks to shungite’s unique structure, it grabs onto many different things including chemicals, volatile organic compounds, drugs, chlorine, fluoride, and radioactive particles. It also kills a wide variety of bacteria, viruses, phages and other pathogens. Shungite can neutralize a significant number of toxins because it holds a massive quantity of hydrogen, making it very effective for water purification. Shungite studies, as well as anecdotal evidence, point to a long list of potential health benefits, listed in the following box.13 Some of these are backed up by studies. Others are simply mentioned in articles. Often a study is described but no citation is provided, making the validity difficult to ascertain. I think a good deal of literature probably exists in Russia, which is difficult to access. Adding to the struggle, many of the studies are in Russian! A natural healthcare clinic in the UK cites a study at National University Pharmacy in the Ukraine that found a significant drop in liver inflammation among hepatitis patients drinking fullerene water, although the author did not provide a citation and I was unable to find the study. In 2006, research was presented at a scientific congress in Russia, entitled “Shungite and the Protection of Human Life.” At this meeting, a large volume of scientific data was presented covering most of the health benefits summarized above. Now let’s take a look at one particularly special application of shungite: radiation protection. Shungite offers protection against both ionizing and non-ionizing EMFs. It’s not clear what the full range of frequencies might be that it affects. Several studies suggest shungite offers protection from ionizing radiation, such as ultraviolet and X-rays. A 2017 rodent study discovered a topical shungite preparation imparted significant protection to hairless mice exposed to UVB radiation due to antioxidant and anti-inflammatory effects. In her book, Regina Martino describes a study at the Ukrainian Academy of Medical Sciences involving volunteer cancer patients. The group drinking water exposed to shungite had their blood panels return to normal within two to three weeks of radiation therapy, whereas the control group took three to four months. The Grigoriev Institute for Medical Radiology at the national Academy of Medical Science of Ukraine exposed rats to radiation. The rats given shungite water for 15 days showed a 95 percent survival rate, compared to 63 percent for the control group not given shungite water. What about shungite and non-ionizing electromagnetic fields—the kind emitted by computers, TV and radio, power lines, cell phones, cordless phones, smart meters, and Wi-Fi devices? These EMFs represent radiation in the radiofrequency and microwave frequency ranges, and they surround us all day, every day. For evidence about shungite’s effects on these, we must dive into the fascinating field of bioenergetics. Bioenergetics researcher Regina Martino has been conducting experiments on shungite since 2006. She studies the impact of natural objects, such as minerals and crystals, on the energetic bodies of living beings, which includes our subtle energy centers or chakras. She defines bioenergetics as the science that studies these “vital fields.” The following is how I understand it, based on what I gleaned from her book. Energetic fields move out from our bodies like ripples on a pond. In most people, the vital field extends out from the body about five to eight feet. Our vital fields are almost immediately affected by any change in our internal or external environment, including food, water, toxic exposures, emotions, lifestyle, and overall health. If there is a persistent disturbance reducing the vital field, it can lead to physical or emotional illness. Chronic exposure to electromagnetic radiation is one of those disturbances. Many people are unaware of how EMFs are affecting them until they are away from them for a while. In repeated experiments, Martino has been able to measure the effects of shungite—and hundreds of other minerals—on human vital fields. She has developed a highly reliable, reproducible way to measure these energetic fluctuations. She has found that shungite, more than any other rock, is able to realign the chakras and optimize the vital field. Essentially, shungite transforms artificial EMFs into biologically compatible frequencies, thereby neutralizing their negative impact. In other words, it transforms harmful radiation—not by eliminating it but by changing its properties. This can happen whether the shungite is in direct contact with your body or just nearby. In particular, shungite greatly increases or concentrates of the vital field in the first chakra, or “root chakra.” The density of our energy (density here is a good thing) is directly linked to the strength of our first chakra. When we feel weak or depleted our energy density is low, but when it’s high we experience greater resistance to external disturbances and a better capacity to recover from illness or emotional trauma. Martino writes much more about this in her book. German studies have demonstrated that electromagnetic radiation from crystals impacts our biophotons. When crystals are placed on or near us, our brain patterns actually change. The effects can be profound when a crystal encounters like-frequencies, a phenomenon known as “resonance.” Shungite appears to transform manmade EMFs into waveforms that are more compatible with our biology. Type I Shungite is the purest and most powerful form of the mineral, but it’s also the most expensive. Because this type is not easy to shape or polish, it is most often used in its raw form. It is the only type I recommend for making shungite water, which is discussed in the next section. Type II shungite (black shungite) can be carved and polished into forms, such as spheres and pyramids. It’s typically used for jewelry, palm stones and larger sculptures placed around a space to mitigate the effects of EMFs coming from your devices, as well as from your neighbors. Many individuals report feeling better when wearing these stones. You may or may not “feel” the energy of a piece of shungite, but sensing is not required in order for you to reap its benefits. Shungite jewelry should be metal-free or at least have a minimal amount of metal, because metal is essentially an EMF antenna. Besides writing, my lifelong passion for art has led me into designing healing jewelry, and my stone of choice is shungite. I also have a collection of shungite gardens for the home and workplace—striking combinations of EMF protective crystals. My feeling is that EMF protection should be as beautiful as it is functional! According to Martino, when shungite is carved into forms, each form has its own unique effects and emanations. She notes pyramids for their high power and range. For example, a pyramid with 2.8-inch sides emanates 9.8 feet from its flat side and 11 feet from each edge. On the other hand, spheres emit a more uniform and harmonious energy that’s better for living rooms and bedrooms. As an aside, shungite placed on or around an electronic device does not interfere with the function of the device. Ideally, you would place shungite both on your body AND around your living space, creating overlapping shields of protection. Electromagnetic fields are ubiquitous today—we can’t see them and we can’t escape them, so the more sources of protection we have, the better. Amazingly, it does not! It is a self-cleaning mineral that does not hold on to negative energies. This is related to the fact that it transforms energy, rather than absorbing it. Shungite has been used commercially in Russia for water purification since the 1990s, and studies continue worldwide. According to Dancing with Water: The New Science of Water and other sources, shungite is effective in removing many types of pathogenic bacteria and other microbes, heavy metals, radioactive particles, nitrates, pesticides, volatile organics, pharmaceuticals, chlorine, and fluoride. Shungite water’s ability to neutralize contaminants is said to come from its capacity for holding a tremendous amount of hydrogen. As some of the previously mentioned studies reveal, shungite water is known for its antioxidant effects, leading many to start brewing up their own. Shungite is said by some to “restructure” water into a more biologically beneficial form, although I lack a clear explanation of this. Many different protocols for making shungite water can be found on the Internet, but a word of caution is in order. I recommend using only Type I shungite (elite shungite, 98 percent carbon or higher) from a reputable source. Some folks are using black shungite, but from the chemical analyses that have been published, there is a risk of leaching heavy metals into the water that you do not want to ingest in large quantities—particularly aluminum, copper, iron, and nickel. Black shungite has between 30 and 50 percent non-carbon elements, which are all water soluble to various degrees and can concentrate in shungite water. The risk is much lower from elite shungite due to its high carbon content, so it’s worth the investment. I use Regina Martino’s protocol for making shungite water. The ratio she recommends is 100 grams (3.5 ounces) of elite shungite per liter of water. Here’s how you make it. Rinse the shungite pebbles to remove dirt and dust. Combine them with water in a glass or ceramic carafe. I use filtered water and a gallon-sized drink dispenser with a stainless-steel spigot for ease of pouring. Let the shungite and water mixture sit overnight, or for three days for maximum effect. Consume one to two glasses per day. Refill your container when the water level gets low. The shungite keeps indefinitely without becoming negatively charged—at least in the energetic sense. That said, there is some risk of the pebbles picking up impurities such as nitrates, chlorine, fluoride, or even mold, so she advises purifying the pebbles in the sun every four to six months. She also recommends changing out your shungite pebbles every two to three years if you’re using heavily chlorinated or polluted water. This is a pretty neat trick for you campers out there—pack some shungite for your next camping adventure! Shungite baths allow you to soak your entire body in shungite love. Simply add 400 to 500 grams (about a pound) of shungite pebbles to very hot bath water. When it has cooled to tolerance, climb in and soak until it’s no longer warm, at least 15-20 minutes. Unfortunately, there is no shortage of dishonest individuals who would love to take your money in exchange for fake shungite. My number one rule is, know your source and buy only from a reputable supplier. The good news is, there is a very reliable way to tell if your shungite is fake. Genuine shungite conducts electricity, which is a rare property for stones and crystals. Other than natural metals like gold, silver and copper, most minerals are good insulators but poor electrical conductors. A few minerals are semiconductors such as galena, pyrite, graphite, sphalerite, cinnabar, and several others, but these do not conduct electricity like shungite. I check my shungite using a digital multimeter. If you don’t have a multimeter, people have done the same process using a basic flashlight, battery, and a couple pieces of wire. Check out my demo video here. Now for a little “mineral identification 101.” Genuine shungite is rarely pure black and will have inclusions, imperfections, flecks and veins of other minerals, such as pyrite and mica. Look for little light colored or metallic flecks and veins, which is a sign you have the real deal. Shungite looks much like the mineral galena (lead ore). However, galena is much softer than shungite and has very different cleavage. Galena cleaves into cubes, in three perpendicular planes as shown in the photo. On the other hand, elite shungite has a conchoidal fracture—meaning, the cleaved surfaces show concentric rings. If you’re familiar with obsidian (volcanic glass), it’s like that. Galena is also very heavy for its size—it has a high specific gravity. Shungite is much lighter because it has a much lower specific gravity. By now, you have a good overview of the latest information about shungite. The evidence for shungite’s water purification ability is certainly compelling. Its ability to mop up radiation and help cleanse our bodies of free radicals is also impressive, because reducing free radicals brings us a step closer to lowering our risk for cancer, chronic disease, and premature aging. Shungite is also antibacterial and antiviral, which is important in this age of increasingly resistant superbugs. More studies are needed, especially in the West. Russia had a jumpstart on us by virtue of its proximity to shungite. Nevertheless, the existing body of data should give us hope! It is tempting to place an inordinate amount of faith in objects that promise us safety, so beware of overconfidence. EMF exposure is cumulative. Even if these stones provide some measure of protection, they are not a license for limitless exposure. We love our technology but we must be smart about its use. The foundation of your EMF defense plan should be minimizing your exposure while supporting your body’s innate ability to protect and heal itself. EMF jewelry should only be used as a “supplement,” an added boost—like adding a multivitamin to an already-healthy diet. The only sure way to protect yourself is to reduce your exposure… unplug, reconnect with nature, eat well, do your emotional “clearing,” and support your body’s detoxification processes. Sprinkle a little shungite into your life! M. Bischof. “Biophotonen: Das Licht in unseren Zellen” (German), Zweitausendeins, ISBN-10: 3861507412. Valerie Burke, MSN is a Clinical EFT practitioner and freelance health writer in Olympia, Washington, with backgrounds in both allopathic and integrative medicine and a Master’s Degree in Nursing Science. Her areas of interest include nutrition and energy psychology, and integrating principles of holistic health to create balance in mind, body and spirit. Valerie is the author of “Is the Paleo Diet Right for You?” You can learn more about her at www.valerieburke.net.